Juan, the amiable neighbourhood meth merchant befriends a small boy who clearly lives in fear of the local bullies. Juan recognises something kindred in the boy, Chiron, who takes a long time to speak so much as his name to Juan and his wife and then it's to explain that most people, meaning the bullies, call him Little. 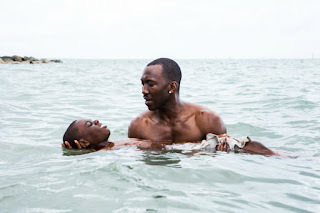 Juan persists with his gentle mentoring of the boy, teaching him to swim and telling the story of how once in the moonlight he was given a nickname which he then rejects, preferring to define himself. Chiron understands but we know how difficult it will be for him to dream of such independence. It's not just the bullies. His mother is one of Juan's customers and her violent mood swings push the boy further away from a life that does not welcome him. Adolescence is no kinder to Chiron. The bullies are worse and his mother's addiction runs hotter and colder. His emerging sexuality confuses him into shame and anger, especially that it seems to match the hateful labelling by the bullies. One act of the closest thing he has known to love is followed by a brutal betrayal. His equally brutal response forms his most decisive act of identity yet and leads him into an adulthood of one ineluctable course. Or does it? Is there some way out? This story of self affirmation is given a muscular treatment by Barry Jenkins on his second feature film. The play with focus and motion at its best (Jenkins can use both excessively) establish solid location and motivation. A 360 pan following the bully in chief as he circles Chiron in the quad, bashing into other people who give way to his violence as though he were a rabid dog creates a freezing dread. The conclusion of the scene with its brutality is almost a relief. The consequent scene that travels from a moment of self-realisation in a mirror to a hardened metaphor of breaking barriers and ends in a retributive act feels finished but, thankfully not satisfying. The violence that repays violence is not celebrated the way it would be in a Stephen King story. The sense that it is the next step of a process is too strong for this to be a gratifying conclusion. That's the thing about this film that pushes it ahead of any comparable outing about forging identity and battling injustice: the absence of sentimentality in a genre characteristically turgid with it keeps things focused and intense but also, strangely, light. There is a strong choreography of character in Moonlight that also sets it apart. The establishment of space, of characters in their landscape and between each other and what that means for the strength of their identity never lets up. A strong cast (some familiar faces but many unknowns) deliver fine goods. Dialogue is lean and the action is intense, allowing moments of beauty to elevate under their own power and very little assistance from the score or burdensome writing. This is a lean masterpiece and a masterpiece of leanness. In recognition, this review will close here.